Companies still lack a strong framework to convert big data sources into high-quality, structured knowledge which can support the enhancement of business process and profit generation. After all, smart data is not only a question of the right software. It’s also dependent on right data engineering. Funded by the Horizon 2020 project, Aligned aims to develop models, methods and tools for engineering information systems based on co-evolving software and web data. In this context a more efficient governance, increased agility and higher productivity are also addressed by the collective of world-class computer scientists from the Trinity College Dublin, University of Oxford, Universität Leipzig and Adam Mickiewicz University Poznan, and market-leading semantic companies like Wolters Kluwer and Semantic Web Company, respectively. Seshat - The Global History Databank: Development of new techniques for data curation, runtime quality analytics as well as curation workflows for the open repository of expert-curated historical time-series data. 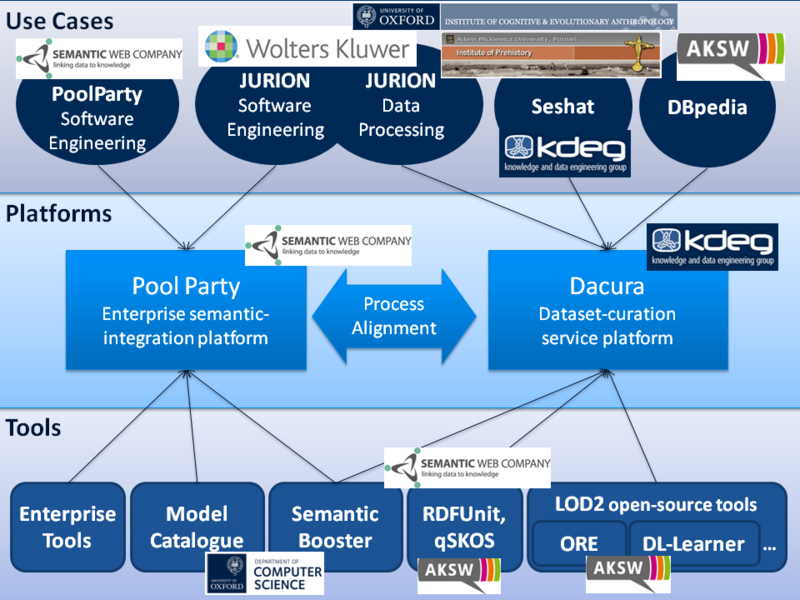 DBpedia and Quality Tool Chain: Provision of methods and tools for the combination of diverse tool development and data life cycle management tasks deployed in the current centre of the web of data DBpedia. Wolters Kluwer JURION (Legal Information System): Enabling the innovative legal information platform which merges and interlinks over one million documents of content and data to address more complex business requirements that rely on tighter coupling of software and data. PoolParty Enterprise Application Development: Development of technology that helps the software for enterprise information integration to generate unified views on distributed business objects and entities relevant for the development processes as well as to coordinate the data management and development workflows required to deliver new versions of the evolving PoolParty product.